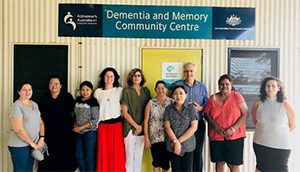 Three aged care employees from Larrakia Nation, an Indigenous community organisation from the area surrounding Darwin, are taking important steps in understanding dementia. They are learning how to better care for those diagnosed with the disease in a three-day course instructed by Klem Hedenig of Dementia Australia, joining other employees from providers in the area. The Dementia Essentials training course, which is nationally accredited, is designed to assist workers in supporting people living with dementia by providing them with strategies in clear communication, planning, developing activities and understanding the behaviours of people living with dementia. Larrakia Nation, as part of their numerous community services, provide aged care and disability support for more than 50 clients and provide culturally appropriate support for people in their community. Lesley, a Personal Assistant from Larrakia Nation, explains why she is attending the course. Her colleague explains that there is very little awareness of dementia in her community but believes the training provided by Dementia Australia will help improve awareness. “Some people have done accredited training, however not many people are fully aware of dementia” she said. “It will improve awareness in our Aged care centre but more training is needed for the whole of Darwin”. Klem Hedenig explains that the lack of awareness and understanding of the condition can lead to those diagnosed without the support they need. “There seems to be a lack of understanding of dementia and this can add to the distress for the families of those diagnosed“ he said. 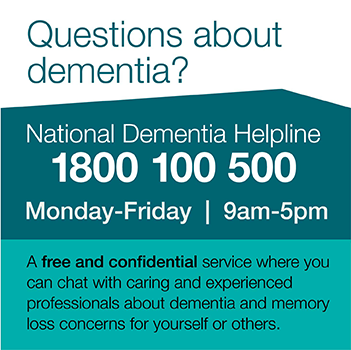 Klem believes that the continued support of Dementia Australia for local aged care service providers will improve awareness of dementia in the Northern Territory.